​About POWER: In 2011, a group of women came together to re-enact the 1908 Oakland Suffrage Parade and the anniversary of suffrage with a event drawing people from all over Oakland, on the shores of Lake Merritt. Elected officials, women's organizations, men, women and children came together to honor those women who gave of themselves completely, to gain women the right to vote. The celebration was a resounding success with over 250 people attending! Working on this event there came a wonderful connection; a pride, loyalty; a desire to continue working together; a "esprit de corp." We decided to keep working together through an all volunteer organization, POWER (Progressive Oakland Women Empowering Reform) Our desire is to acknowledge change agents in our community, to acknowledge the contributions made by individuals and institutions that support the Oakland community. The Seventh Annual Deliliah Beasley Tea was a wonderful success! Thank you to all who attended. 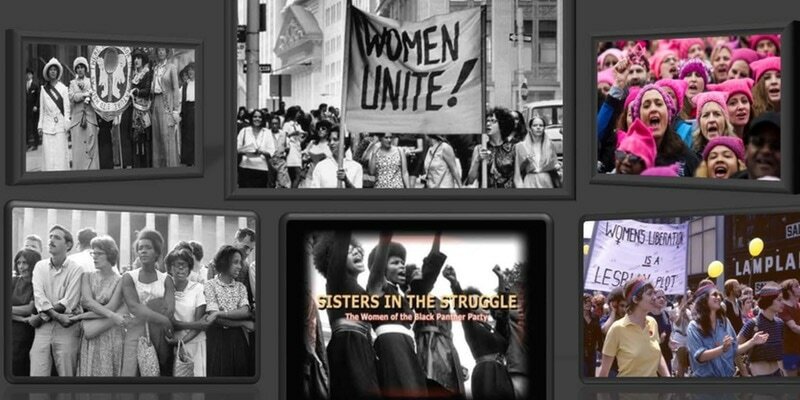 More than a tea party - experience this extraordinary celebration of 100 years of empowered women making change in Oakland. 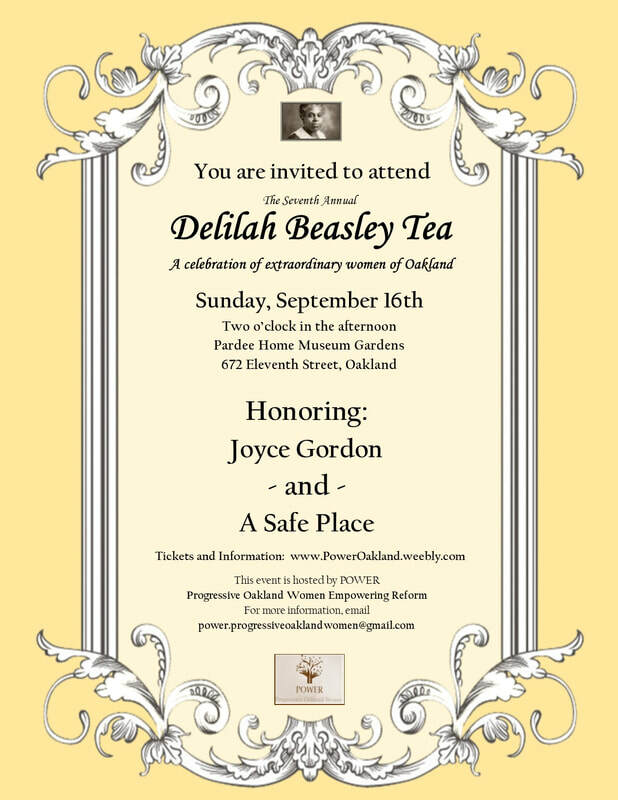 ​WE ARE PROUD TO PRESENT OUR 2018 HONOREES: At this year's Delilah Beasely Tea, POWER is excited to honor Joyce Gordon and A Safe Place. Joyce Gordon of Joyce Gordon Gallery and Joyce Gordon Foundation of the Arts: "Before there was Oakland Art Murmur and First Fridays, there was Joyce Gordon Gallery, a pioneer gallery in putting Oakland on the map in the art world", said Samee Roberts, cultural arts and marketing manager for the City of Oakland, “She invested in downtown Oakland before it was fashionable.” In addition to running one of the oldest commercial art galleries in the City of Oakland and County of Alameda, Joyce Gordon has provided a free space and home to youth organizations to nurture growth in performance and community outreach such as support programs for the victims of the Ghost Ship fire of 2016. Perhaps the most outstanding venture of Joyce Gordon would be her nonprofit, Joyce Gordon Foundation of the Arts. The organization supports diverse communities throughout Alameda County with an emphasis on Oakland and youth in which working art professionals are paired with youth and young adults for professional development experience in building portfolios, screen printing techniques, painting, sculpting and other activities. A Safe Place: It is timely to single out Oakland’s A Safe Place as they celebrate 40 years of milestone community service committed to breaking the cycle of violence for women and children suffering domestic violence and intimate partner abuse. 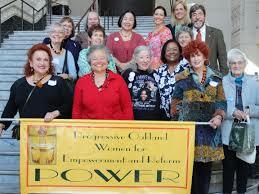 Forty years ago, A Safe Place was founded by a group of women committed to helping women and families in the East Bay. It has evolved from a crisis line in the basement of an Oakland church to the only Oakland emergency shelter for women and their children to comprehensive trauma informed programs and mental health services. A Safe Place is recognized as a national model for its innovative scope of services that include trauma informed care, individual and group counselling, children’s programs, comprehensive domestic violence in-service training, as well as services for transgender, men, prison/reentry clients, trafficking; community awareness programs/teen dating violence prevention, and host/creator of national Domestic Violence innovative service training conferences. The executive director Carolyn Russell, the talented Board of Directors, exceptional staff and mental health service partners, as well as a cadre of trained volunteers are key to their historic achievements and visionary programs moving forward. About the Tea: Inspired by its namesake, Delilah Beasley (1874-1934), a historian and newspaper columnist for the Oakland Tribune and the first African-American woman to be published regularly in a major metropolitan newspaper, our annual tea celebrates today’s change-leaders working hard for the betterment of our community. We welcome you to join us in honoring the change-leaders of today at our elegant tea accompanied. The afternoon program includes awards, live music, sumptuous pastries, and what promises to be an unforgettable summer afternoon. The tea affords POWER and the community the opportunity to honor and celebrate extraordinary community leaders and organizations whose vision and leadership inspire, enrich, transform and empower our communities.